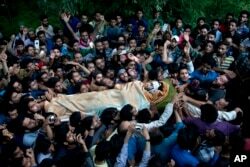 Syed Salahuddin, Supreme Commander of Hizbnul Mujahideen, warns on Aug. 11, 2016, that his followers will storm the cease-fire line that divides the region unless New Delhi ends its current wave of violence against Kashmiris. “We will now have to announce and God willing practically cross the bloody line [the disputed Kashmir border] together with the entire population of Azaad Kashmir [Pakistani Kashmir] and mujahideen (holy warriors) as well as refugees [who have come from the Indian side] without fearing any restrictions,” Salauhddin said. He did not announce a date. Kashmiri protesters shout pro-freedom slogans during a protest march in Srinagar, Indian controlled Kashmir, Aug. 11, 2016.